Home › Stories › Nature Springs a surprise! 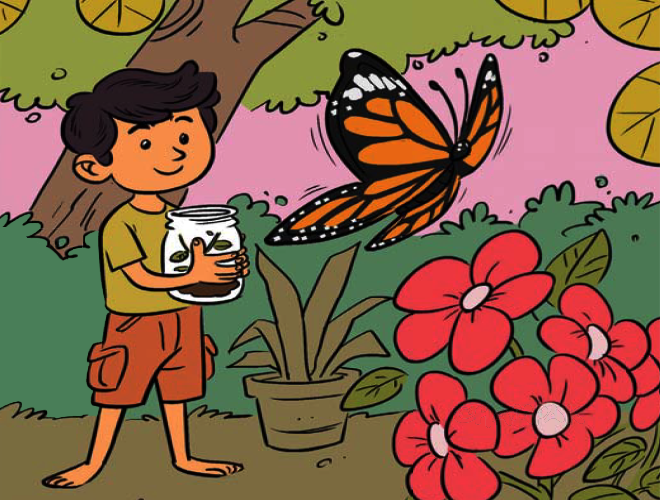 One day, when Dhruv was playing in the garden, he spotted a hairy worm-like creature on a leaf. “Dhruv, this is a caterpillar—the young one of an insect. Why do you want to harm it?” asked Grandpa. “But grandpa, it looks so ugly. It must surely be bad,” replied Dhruv. “Something big, hairy and very ugly!” said Dhruv. Dhruv did as told and returned with a glass jar. Grandpa carefully placed the caterpillar inside it along with a few leaves for it to feed on. He then sealed the opening with a handkerchief and used a rubber band to hold it in place. 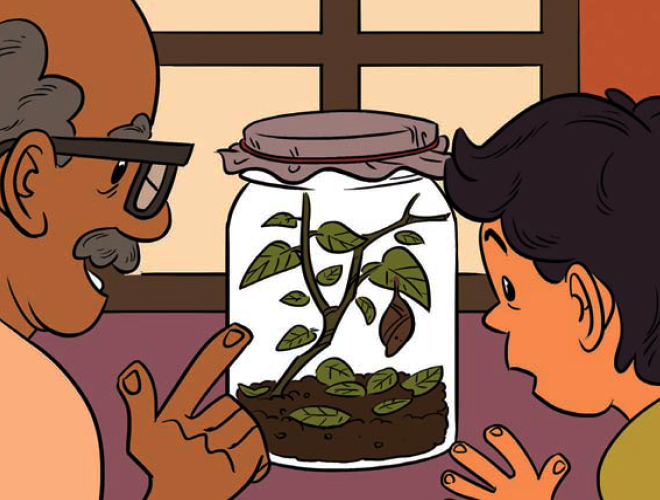 Over the next few days, Grandpa and Dhruv regularly removed the dry leaves from the jar and replaced them with fresh ones. That weekend Dhruv had to go out of town along with his parents to visit his aunt. By then, he had come to care for the “ugly” caterpillar. So he pleaded with Grandpa to take good care of it while he was away. As soon as he returned on Monday, he went straight to see the caterpillar. But he was shocked to not find it inside the jar. As much as he tried, he could not spot the caterpillar amid the drying leaves. He was heart-broken. Just then Grandpa came in. “Grandpa, you forgot to feed fresh leaves to my caterpillar and now it is gone!” said Dhruv sadly. “Your caterpillar is right here,” said Grandpa smiling. He pointed to something brownishgrey in colour stuck to a leaf. “Your caterpillar changed into this while you were away. This is called the chrysalis—a stage when your caterpillar is undergoing a transformation. It does not need any food for now,” he explained. From that day on, Dhruv began to keep a close watch on the chrysalis. One morning, he noticed something colourful within it. After a few hours, a beautiful yellow and black butterfly emerged from the chrysalis. Dhruv could not believe his eyes! “So, the caterpillar was a baby butterfly!” he said surprised. Dhruv released his butterfly in the garden. “Nature is full of surprises,” he thought as he happily watched it flutter its wings and fly among the flowers.